This com­ing Sun­day is the annu­al cel­e­bra­tion of the Holy New Mar­tyrs and Con­fes­sors of Rus­sia. We offer to our read­ers the epis­tle of the Coun­cil of Bish­ops of the Russ­ian Ortho­dox Church Out­side of Rus­sia to all the faith­ful chil­dren of the Russ­ian Church upon the glo­ri­fi­ca­tion of the mar­tyrs and con­fes­sors in 1981. The Russ­ian Ortho­dox Church Out­side of Rus­sia, that is, beyond the bor­ders of the home­land, con­fess­es itself to be an inte­gral part of the Moth­er Church of Rus­sia, which has nour­ished and nur­tured the Russ­ian nation and found­ed its cul­ture and its great realm. It alone is able to speak in the name of the Church of the home­land. Before ordeals by fire descend­ed upon the Church in Rus­sia, the Lord, Who fore­sees all things, with His mighty arm led forth a small por­tion there­of beyond the bound­aries of the Russ­ian state, thus pre­serv­ing its eccle­sial lib­er­ty and com­plete free­dom from sub­jec­tion to any polit­i­cal pow­er what­so­ev­er in the world. The thir­ty-four Russ­ian bish­ops who found them­selves abroad, on the strength of the divine­ly inspired decree of His Holi­ness, Patri­arch Tikhon and the Sacred Syn­od, dat­ed Novem­ber 20, 1920,1Ukaze No. 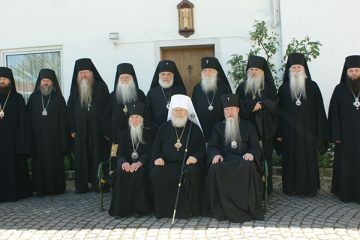 362, which called for bish­ops cut off from the Moth­er Church to estab­lish an inde­pen­dent Supreme Church Author­i­ty until such time as nor­mal rela­tions could be estab­lished estab­lished the Russ­ian Church Out­side of Rus­sia, whose exis­tence has con­tin­ued to our times. Its first head was Met­ro­pol­i­tan Antho­ny of Kiev and Galich, who had been the prime can­di­date for the office of Patri­arch at the Moscow Coun­cil of 1917–1918.2The pro­ce­dure estab­lished for elect­ing the Patri­arch, an office re-estab­lished by the same coun­cil, called for lots to be drawn between the top three vote-get­ters. This is some­times called the “Apos­tolic method” (cf. Acts 1:15–26, the elec­tion of Matthias as twelfth apos­tle). Although Met­ro­pol­i­tan Antho­ny (Khrapovit­sky) received the great­est num­ber of votes, it was the third-place vote get­ter, Met­ro­pol­i­tan of Moscow Tikhon (Belavin), whose name was drawn. A fuller account of the elec­tion may be found in Cho­sen for His Peo­ple: A Biog­ra­phy of Patri­arch Tikhon, pp. 14–16. Its sec­ond head was Met­ro­pol­i­tan Anas­tassy, a mem­ber of the Pan-Russ­ian Syn­od, and its third head, who still func­tions as such, is Met­ro­pol­i­tan Phi­laret. 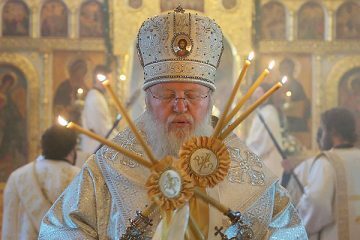 At present, the Coun­cil, com­prised of eigh­teen bish­ops, is the supreme author­i­ty of the Russ­ian Church Out­side of Rus­sia. With­out sep­a­rat­ing itself from the Moth­er Church, fol­low­ing her life with an atten­tive, lov­ing and devot­ed gaze, the part of the Russ­ian Ortho­dox Church which finds itself out­side of Rus­sia rejoic­es at her suc­cess­es and grieves over her tribu­la­tions and tri­als. It knows and con­fess­es that the life of the Church in the home­land, begin­ning with the year 1917, and even unto our own times, has been trav­el­ing a dole­ful, but glo­ri­ous path — a path of mar­tyr­dom, of con­fes­sion of the faith, of depar­ture into the cat­a­combs, of ille­gal exis­tence, of war with mil­i­tant athe­ism and the enslave­ment there­by of the pas­tors of the Church. 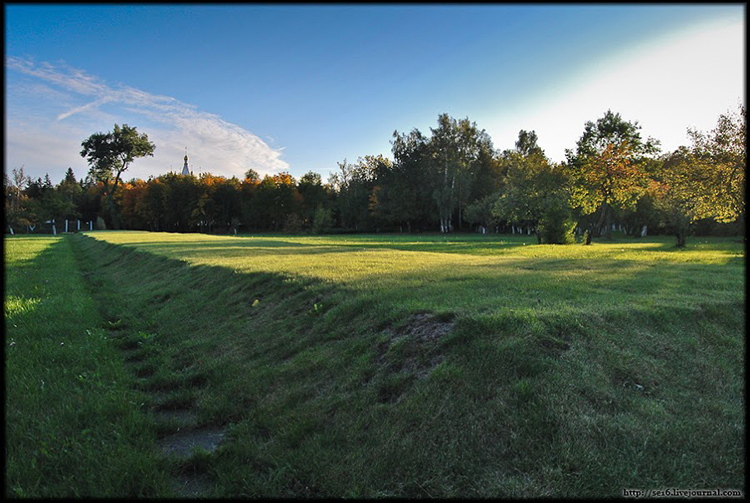 One of the mass graves at the infa­mous Butovskij Poligon (Buto­vo Field) in the out­skirts of Moscow used by the sovi­ets to exe­cute and dis­pose of reli­gious and polit­i­cal unde­sir­ables. 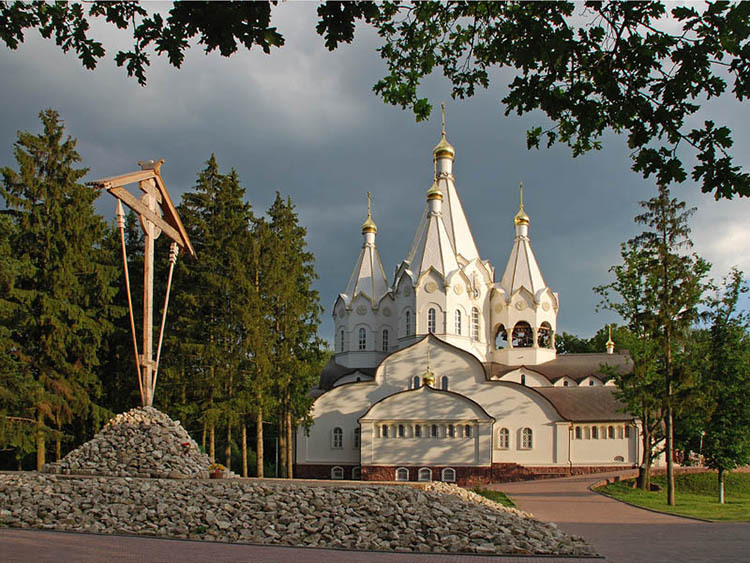 The steeple of the Church of the New Mar­tyrs can be seen over the trees in the dis­tance. At the height of the dread­ful, bloody and God-hat­ing rev­o­lu­tion, many mil­lions of Russ­ian peo­ple, to safe­guard their own safe­ty, went over to the “Liv­ing Church,” cut them­selves off from the Church, igno­min­ious­ly reject­ed the faith of their ances­tors, and even defect­ed to the camp of the athe­ists and raised their chil­dren with­out ben­e­fit of reli­gion. 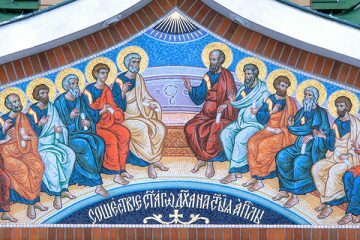 Dur­ing this ter­ri­ble peri­od of apos­ta­sy, the Church, mind­ful of the words of the Sav­ior: In the world ye shall have tribu­la­tion: but be of good cheer; I have over­come the world (Jn 16:33), led to Christ a mul­ti­tude of holy mar­tyrs, fear­less con­fes­sors, Ortho­dox Chris­tians who suf­fered and were slain undeser­vedly for the faith. Their blood has washed away the infamy of the apos­ta­sy of their blood kins­men. They became a vol­un­tary sac­ri­fice of purifi­ca­tion for the sins of the nation. But those who fought against God cel­e­brat­ed their vic­to­ry over their inno­cent vic­tims. 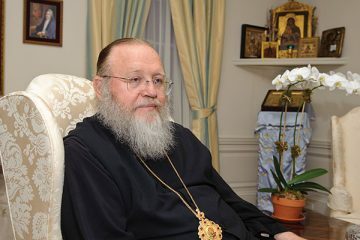 The meek tsar, who had been for­sak­en by every­one, they slew, as a sym­bol of the Ortho­dox realm; they put to death the pas­tors of the Church who held it togeth­er, as well as monas­tics and mem­bers of the laity, those who loved Christ — men, women and even inno­cent chil­dren. With sub­tle moral tor­tures, they com­mit­ted mur­der, they des­e­crat­ed, they shot down, they bat­tered to death, they slew with star­va­tion, with cold, and with oner­ous labors in death camps. Drunk on the blood of their vic­tims, the tor­men­tors reached the point of total insan­i­ty: they buried peo­ple alive, drowned them in rivers, cut out their tongues, hanged them in church­es from the Roy­al Doors, mur­dered their wives and chil­dren. A sin­gle charge was suf­fi­cient to result in exe­cu­tion: this is a ser­vant of God, a believ­ing Chris­t­ian! The faith­ful went like lambs to the slaugh­ter, mute, sub­mit­ting to the will of God, even unto death. Noth­ing was able to sep­a­rate them from their love for Christ, not tribu­la­tion, or dis­tress, or per­se­cu­tion, or famine, or naked­ness, or per­il, or the sword (cf. Rom. 8:35). This strug­gle illu­mined the Ortho­dox Church with new glo­ry dur­ing those days of per­se­cu­tion; they became our glo­ry, our vic­to­ry, our joy. They depart­ed from the Church Mil­i­tant as con­querors and entered into the ever­last­ing joy of the Church Vic­to­ri­ous. But the Church of Christ is one, and both aspects there­of, earth­ly and heav­en­ly, live a sin­gle life, through love for Christ alone! Gaz­ing upon their feat, we suf­fered with them, we prayed for them. Yet more and more often the faith­ful inquired whether it was not time to pray to them instead of for them. For it was beyond doubt that they had already entered into the joy of their Lord. Each local auto­cephalous Ortho­dox Church can­on­izes its own saints by a res­o­lu­tion of its Coun­cil of Bish­ops, which fol­lows the desire of the pas­tors and flock who believe in the sanc­ti­ty of a mar­tyr and who wish to pray to him in the com­mon prayer of the Church. The Russ­ian Church in the Sovi­et Union is not now able to do this, since it is deprived of the abil­i­ty to speak its mind and to act accord­ing to its con­vic­tion. It is squeezed in the vice of the god­less admin­is­tra­tion which has made the Church’s sub­jec­tion its task, to be fol­lowed by its total anni­hi­la­tion. It does not have bish­ops who func­tion and par­tic­i­pate freely, who would pro­mul­gate an offi­cial act of can­on­iza­tion. They are silent. But the god­less bear false wit­ness before the whole world, that there were nev­er any mar­tyrs for the faith, that the believ­ers of Rus­sia enjoy com­plete free­dom to con­fess the faith. And behold, that which no one else is able to do, the Coun­cil of the eigh­teen bish­ops of the Russ­ian Ortho­dox Church Out­side of Rus­sia, as the least part of the whole Church of Rus­sia, has brought to pass, not in its own name, but with fear and trem­bling, rev­er­ent­ly ven­er­at­ing the blood of the mar­tyrs. We joy­ous­ly inform you, our broth­ers and sis­ters, that in New York City, on Sun­day, 19 October/I Novem­ber, 1981, our Coun­cil of Bish­ops glo­ri­fied with the saints the new mar­tyrs and con­fes­sors of the Church of Rus­sia, hav­ing been wit­ness to the desires and prayer­ful aspi­ra­tions of its own pas­tors and flock, as well as those of the daunt­less con­fes­sors in the home­land. This is what one of them writes: “Do not set aside the glo­ri­fi­ca­tion; do not be swayed from your pur­pose. The thought of glo­ri­fy­ing the mar­tyrs with the saints, with which God has inspired you, is wit­ness to the fact that He has cho­sen you for this.” (let­ter dat­ed June 8, 1981). By the act of glo­ri­fi­ca­tion, the Church gives expres­sion to its love for the mar­tyrs, its con­fi­dence that they are holy in the sight of the Lord, its ven­er­a­tion of their strug­gle, its desire to emu­late it and to pray to them with love for help for us sin­ners. And in this prayer of love is real­ized that mys­tery of uni­ty for which our Sav­ior prayed, that they all may be one; as Thou, Father, art in Me, and I in Thee (Jn 17:21). In this mys­tery Heav­en is bowed down to the earth, those of earth are raised to Heav­en, the mar­tyrs’ prayers in our behalf are filled with our faith and love for them, and we are strength­ened by their prayers. Through the glo­ri­fi­ca­tion of the mar­tyrs we are account­ed wor­thy of the supreme aid of God through their prayers. And this aid is need­ful to all that wish to live in accor­dance with God’s com­mand­ments, espe­cial­ly for the Chris­tians of our time who are per­se­cut­ed and afflict­ed. Beloved brethren and sis­ters, let us pray zeal­ous­ly to those who are might­i­er than we and who are with us. They are van­quish­ing the world, despite the fact that they had tri­al of cru­el mock­ings and scourg­ings, yea, more­over of bonds and impris­on­ment… being des­ti­tute, afflict­ed, tor­ment­ed (Heb. 11:36–37). But those of whom the world was not wor­thy, as the Apos­tle puts it, received not the promise (that is, the full blessed­ness and joy of ever­last­ing life, await­ing us) that they with­out us should not be made per­fect (Heb. 11:38–40). They are wait­ing for us! They are cry­ing out to us to fol­low them! Hav­ing them as our inter­ces­sors, let us lay aside every weight and the sin which doth so eas­i­ly beset us, and let us run with patience the race that is set before us,.. .lest [we] be wea­ried and faint in [our] minds (Heb. 12:1, 3). 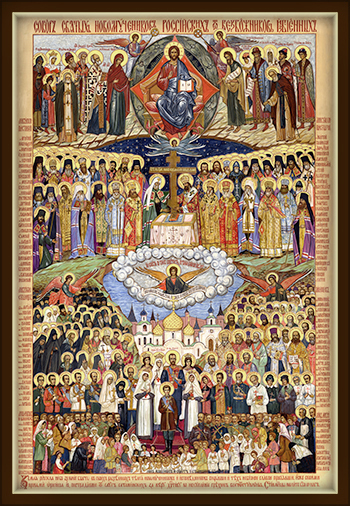 Holy new mar­tyrs and con­fes­sors, pray to God for us!